Need more information about booking Home 9409988 ? 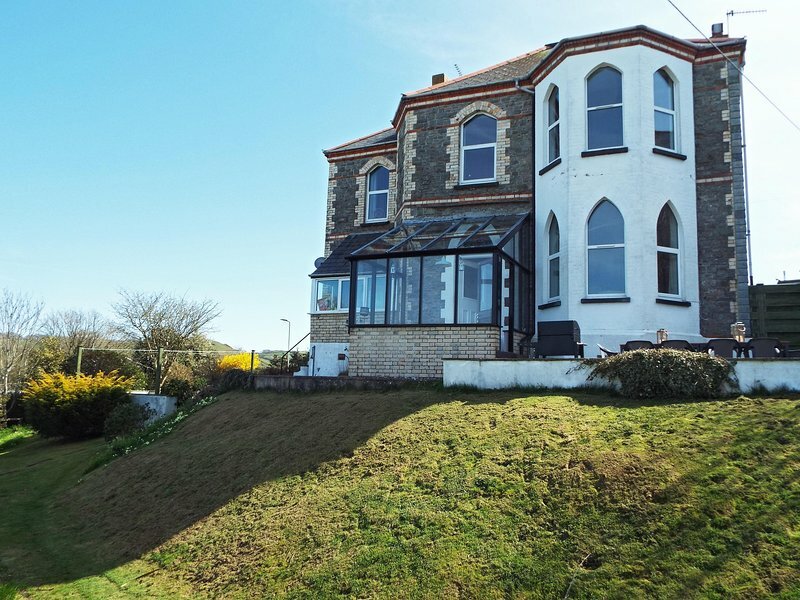 Holly House is a stunning 5 bedroom, 4 bathroom Victorian house in a quiet part of Ilfracombe, but still within walking distance of the coast, harbour and town centre pubs/restaurants. It sleeps up to 10 people. Its position gives it commanding views of the coast, outer harbour, Hillsborough Iron Age hill fort, and also wonderful countryside. It offers ideal accommodation for families, groups, and to celebrate special occasions. Please contact us if your party includes children as the house may not be suitable for some younger children. It has a spacious living room with 2 leather sofas and chair (3 of the seats fully recline) plus a bean bag. The views from this side of the house are amazing, however if you can tear yourselves away from the views, there is a 65” 4K/3D TV, with a 4K/blu-ray/DVD player plus home cinema 5.1 surround sound system! An extensive selection of films/TV box sets (and books) are available, with 3D glasses to watch the 3D blu-rays. The impressively light, triple-aspect kitchen has a halogen hob, electric double oven, microwave, dishwasher, large fridge/freezer, washing machine, and numerous small appliances (Tassimo coffee pod machine, food mixer, sandwich maker, slow cooker, pressure cooker, electric carving knife, and of course, kettle and toaster!). A large range of Denby crockery adds to the luxury feel, and there are ample pots, pans, baking trays, casserole/serving dishes & utensils for keen cooks, plus cafetieres and tea pots! There is also an iron and ironing board. The oak dining table can seat 10 people. There is also a hi-fi system (with Bluetooth connectivity, USB input, radio and CD player) if you wish to listen to music while cooking or eating. A dark oak parquet floor flows from the kitchen/diner into an impressive hall, from where a majestic sweeping staircase takes you to the first floor accommodation. A smaller 5th bedroom contains a desk, and a luxury leather double sofa-bed with memory foam mattress (but please note that there is no wardrobe or chest of drawers in this bedroom). The 3 largest upstairs bedrooms all have modern en-suites, with 4ft wide showers and chrome heated towel rails. The 4th and 5th bedrooms share the family bathroom with its contemporary double-ended bath, complemented by another 4ft wide shower and chrome heated towel rail. The house is fully double glazed, with central heating throughout, and endless instant hot water from the large gas combi-boiler. Broadband Wi-Fi is available throughout the house. At the rear of the property there is a small conservatory. And a large terrace, with charcoal BBQ (with tools and cover), 10 patio chairs and 2 tables so you can all enjoy alfresco dining while taking in the views to the coast. One of the tables can be used in the conservatory if it is too cool to eat outside. A reasonably sized garden sits to the side and rear of the property, with a large expanse of lawn, along with an interesting selection of mature shrubs, fuchsias and camellias. The property has parking on the drive for 2 cars, but there is also ample free parking on the wide road directly in front of the house (unlike on some of roads in Ilfracombe and the surrounding area!). No smoking, no pets, no wheelchair access. The easiest way to explore the area is by car, bike or by walking. There are regular buses to Barnstaple, Braunton, Berrynarbor, Mortehoe/Woolacombe & Lee. Not suitable for wheelchair access or people with mobility issues (due to the steps out to the rear garden). This is a quiet neighbourhood, so please be considerate of our neighbours by not making noise on the patio area after 11pm! Please note that the house may not be suitable for young children...there are steep steps from the kitchen to the garden; there is no stair gate; there are no single beds, high chairs or cots. This House has 5 bedrooms, 4 bathrooms and sleeps 10. It’s been listed on Holiday Lettings since 15 Apr 2018. Located in Devon, it has 4 reviews with an overall rating of 5. The average weekly rate varies from £859 to £1837. Excellent: the house offers everything you need for a great stay and very well thought out. From the well equipped kitchen to the decor to the large 3D TV (Select a film from the large varied selection on a rainy day). Excellent views from the rear of the property and within walking distance of the harbour and town centre. I would definitely recommend this property. Owner's reply: Thanks so much for taking the time to leave such a positive a review of Holly House! We are so happy that you enjoyed the house and its location, and it is wonderful that you would recommend it to future guests. You can get in touch with Grant (the owner) through the contact form on this page. Send Grant (the owner) an email through the contact form on this page. Alternatively, if there’s a phone number on this page, you can call them. How do I contact Grant (the owner)? If you’ve already booked, go to Manage your holiday booking to view Grant the owner's contact details or send them a message. Or send Grant (the owner) an enquiry through the Contact the owner/manager form if you’d like a quote or more info first. When you pay online through the Book your stay form, a booking request is sent to Grant (the owner). You’ll find out within 24 hours whether they’ve accepted - no money will leave your account before then. You can also request a quote from Grant (the owner) through the contact form. The owner will email you the total cost for your dates and a link to book and pay online. Use the Book your stay form to pay provisionally online. You can pay by credit/debit card or PayPal. Grant (the owner) will have 24 hours to accept the booking and no money will leave your account before then. Why can't I call Grant (the owner) before booking? You’ll need to contact Grant (the owner) to do this. Send them a message in Manage your holiday booking or through the contact form on this page. You can request to change the dates or number of people on your booking via the Manage your holiday booking page. To change your holiday dates use the Edit booking button. If you need to change the number of guests staying then send Grant (the owner) a message. If Grant (the owner) agrees, they’ll send you a revised quote outlining the changes. You can review and accept/decline this from the Manage your holiday booking page. You’ll have 48 hours to take action before the revised quote expires.